Anyone who looks for people on the Internet knows that rarely do we encounter information complete enough to instantly qualify the person as a potential candidate or a potential client. Say, if I am browsing a forum with posts on the desired technology, I see the names of members; there’s a need to cross-reference those names to find out more. 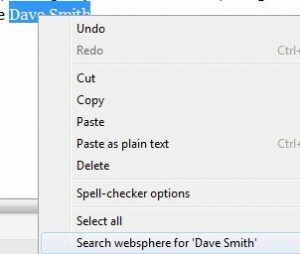 Here’s how to cross-reference names using Chrome. Taking the tip from Find Everything Using Chrome further, we can speed up cross-referencing and avoid boring and time-consuming cutting and pasting. Let me show you how. To start with, you can designate the “find everything” search, described in the post referenced above, to be “the default” in Chrome. Then, if you run across the name of a person who is potentially a candidate or a business contact, you can select (highlight) the first and the last name, right-click, and Google that person right from the page you are currently browsing. This may work wonders for unique names but wouldn’t do well for common first-and-last names. To continue getting relevant results, no matter how common the name is, you can add a keyword or two relevant to the current search. Of course, you can add words other than websphere, several keywords at once, or something like site:linkedin.com – depending on what’s most likely to help you cross-reference. 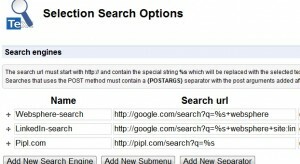 – and define variations of your search, all of which would be available from the right-click menu. What I personally find the most valuable in this productivity technique is the ability to narrow down your cross-referencing to particular terminology, thus staying focused on the search. Speeds up my work many-fold.